Was President Gerald Ford a Born-Again Christian? Was Gerald Ford a born-again Christian? By all accounts yes. Ford grew up religious in Grand Rapids, Michigan, but as he moved into politics in his adult life most of that had subsided. He did however make a genuine re-commitment to Christ, which he nurtured and continued into the presidency and continued after he left office. It was Billy Zeoli, now president of www.Gospelcom.net (the parent company of Gospel Films) that helped Ford get back on track when Ford was a Congressman. Zeoli brought Ford a Bible, but he says it was at a chapel service for a Cowboys verses Redskins game that Ford recommitted his life to Christ. Zeoli was involved in ministry to professional athletes. Ford shared with Zeoli a passion for sports. When Ford became president Zeoli wrote a weekly devotional for him and conducted regular Bible Studies throughout Ford's tenure. Those devotionals are available in book form with an introduction by Gerald Ford in a book called, "God Has a Better Idea." Gerald Ford's son Michael is today an ordained minister who attended Gordon-Conwell Theological Seminary in the Boston area. When his son graduated in 1977 Ford gave the commencement address and spoke of his own faith. Ford also spoke at Wheaton College. 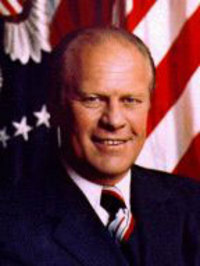 Gerald Ford: "I pledge my life recognizing I am no longer my own, belonging to God who has called me to lead the world. To this end, I will stand for the hurting, the hopeless, the unloved. I will say what others refuse to say. I will reach the world without losing sight of the neighborhood. I will walk upright, speak the truth, and live above reproach. I will not be ashamed to fall on my knees, to cry out to God, to shed tears for the dying, to [live] a life worthy of a leader, to stand up and lead my generation that all may know that Jesus Christ is alive." To see the video of Gerald Ford reciting this pledge click here. First let me say I don't like the term "evangelical." I never use it for myself, and I don't recall anybody ever using it when referring to me. It has been used to marginalize and define people for political and / or popular media purposes. Yet, the word is out there and is both descriptive and misused, so if you can't beat them, we'll join them for the sake of this conversation. An Evangelical is basically defined by two things: (1) They had a point in their life where they had a conversion to Jesus Christ, an experience that they can point to. (2) They believe the Bible. Even that second definition is variously defined within the movement. But it is safe to say "Evangelicals are Bible believing converts to Jesus Christ." It has nothing to do with political associations or social activism. As such Pat Robertson is certainly an evangelical, as is Jimmy Carter. Ollie North by definition is an evangelical, as is Bono from U2. (listen to the podcast where he talks about his faith and inspiration.) Jerry Falwell falls into the category, as does Joel Osteen. Deion Sanders, George Foreman and Kathie Lee Gifford all register as evangelicals. It's a pretty broad category, as the definition is pretty generous. Folks that have come to believe in Jesus and the Bible. Evangelicals can be found everywhere as they live and work among us. You won't however find too many in New England and the Northeast, as the Time Magazine map shows. The Time Magazine map (from the "America turns 300 Million" issue) shows the number of evangelicals per one thousand people. 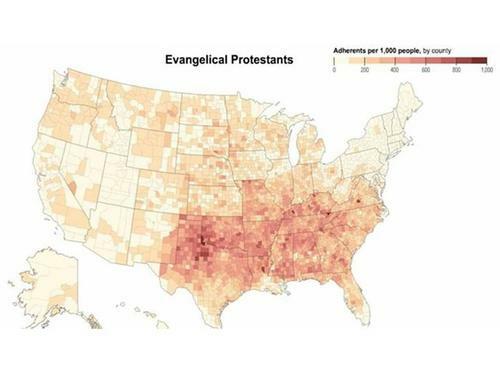 The tan color (double click the map to blow it up) of New England shows less than 100 in 1,000 are evangelicals. People who converted to Jesus and believe the Bible. George Barna shows similar statistics and has Connecticut at the very bottom of the barrel of evangelical adherents. We are 'dead last' with the lowest number of converts to Jesus in the USA! Wow! New England is a bona fide mission field with less than 10% evangelical. We send missionaries to countries with larger Christian populations than that. According to Patrick Johnstone of "Operation World" (who tracks believing populations around the world) countries with larger believing populations than the state of Connecticut include Guatemala with 23%, Nicaragua with 15.1%, Ethiopia with 13% and Zaire with 21%. Don't hear me wrong, we are responsible as New Testament Christians to send our people to fields abroad. But Connecticut is as dark spiritually as many fields we send missionaries to. Read my friend Bill Lamorey's post about church planting / missions work in Connecticut. * Of the 86 largest metropolitan areas in the nation, those with the lowest proportion of evangelicals were Salt Lake City, Utah; Hartford, Connecticut; and Providence, Rhode Island. * Involvement in an adult small group is most prolific in Shreveport, Louisiana. The three areas with the lowest rates of small group participation are Albany (NY), Boston and Providence. * Adults are most likely to claim they have a responsibility to share their religious beliefs with other people if they live in Birmingham, Alabama. That perspective is least common in Providence and Green Bay. * Believing that God is “the all-knowing, all-powerful creator of the universe who still rules it today” is most common in Tulsa. It is least predominant in Boston and San Francisco. * One out of every six residents of Massachusetts, Connecticut and Washington are atheist or agnostic – nearly double the national average. Atheists and agnostics are hardest to locate in Louisiana and Missouri. There are other areas around the country that have relatively low percentages as well, including parts of southern California. The difference there is the density of the populations. So while the percentages may be low, the numbers are high. Los Angeles County has a small percentage of Evangelicals, but because of population density has millions of them. I'm not complaining. But we do have our work cut out for us. It's appropriate for us to maintain a missionary posture and find creative and innovative ways to reach more people with the Good New of the Gospel of Jesus. Look out Connecticut, here we come! It's ironic that the killings of the young Amish children were in the village of Paradise, Pennsylvania. It was the third school violence incident in the United States involving guns in one week. This time it was in the most unlikely of places, in an Amish community, where non-violence and pacifism are practiced and held as high vlaues. Where was God in the midst of the killing of the Amish school children? It's a good question and one that we should ask and try to answer. When we start to dig a little deeper, looking at the lives of some of those involved, we start to see Him all over the place. Understanding where God was begins with the knowledge that faith goes deeper than tragedy and life goes deeper than death. THE AMISH COMMUNITY DOESN'T SEE GOD AS REMOVED FROM THE SITUATION. In fact their lifestyle and belief structure predicts that such horrible things will happen. The Intelligencer Journal, a Lancaster County newspaper, quotes Amish researcher Donald Kimball, "The Amish are a resilient, peace-loving people of faith who won't be changed by Monday's spasm of violence, which they likely will view as a one-time incident. 'I think the community will understand it as an aberration, a crime committed by a man with a severe psychiatric disorder... I think they have a sense of resignation in accepting these kinds of things as somehow a part of God's larger plan.'" David Weaver-Zercher, of Messiah College said in the same article that the Amish have a view of the world as "an evil place, and one's only security is with God." THE ELDERS IN THE AMISH COMMUNITY ARE TALKING FORGIVENESS. Rev. Robert Schenck told CNN he was standing with the grandfather of one of the slain girls, while the grandfather was teaching the young boys that they were not to hate. He is quoted as saying, "We must not think evil of this man." Amish woodworker, Sam Stoltzfus told an Associated Press reporter that "the families would be sustained by their faith." He said, "We think it was God's plan, and we're going to have to pick up the pieces and keep going. A funeral to us is a much more important thing than the day of birth because we believe in the hereafter." The same article that quotes Stoltzfus, quotes Jack Meyer, a member of the Brethren community who said people were trying to follow the teachings of Jesus. He said, "I don't think there's anybody here that wants to do anything but forgive and not only reach out to those who have suffered a loss in that way but to reach out to the family of the man who committed these acts." Wow! Reaching out to the family of the man that killed your children. 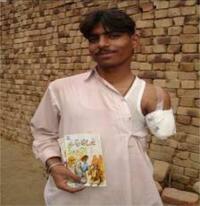 Supernatural power and love exists in the hearts of the effected Amish families. God is spilling out all over that situation. THE KILLER WAS HAVING AN AWFUL TIME IN HIS RELATIONSHIP WITH GOD. Charles Carl Roberts IV, was having a hard time finding God in just about anything. He was experiencing a number of troubling thoughts that he recorded in suicide notes he left for his family. He was particularly troubled by the death of his daughter, Elise, born prematurely in 1997 and living for only 20 minutes. In his note Robarts said Elise's death, "changed my life forever. I haven't been the same since it affected me in a way I never felt possible. I am filled with so much hate, hate towards myself, hate towards God and unimaginable emptiness it seems like every time we do something fun I think about how Elise wasn't here to share it with us and I go right back to anger." Whew, that's some tough stuff, really rough emotions. But not a denial of God or His existence, just an overall anger. One of the strangest places that God showed up in the incident was that Marie Roberts, the killer's wife was leading a prayer meeting for the community's schoolchildren at the time that he had stormed into the one-room classroom. Marie Roberts has been asking for prayer all along in this tragedy. CNN reported on Wednesday night, October 4th in an interview with two of the midwives that delivered two of the Amish girls that died, that Marie Roberts had asked to meet with the families of the slain children after the funeral and the Amish bishop agreed. Even emergency response workers were saying "God was with us while we were taking care of those kids." Smith closed his portion of the service by dedicating his new song, “See You on the Other Side” to the “five precious girls” who died in the shooting, Naomi Rose Ebersol, Anna Mae Stoltzfus, Marian Fisher, Mary Liz Miller and Lina Miller. THE POWER OF GOD WAS EVIDENT IN SO MANY PLACES IN THE MIDST OF SUCH A HORRIBLE TRAGEDY. Forgiveness is being extended to Roberts family by the Amish. God has been evident throughout this whole situation. Enos Miller, the grandfather of the two Miller sisters, was with both of the girls when they died. He was out walking near the schoolhouse before dawn Wednesday _ he said he couldn't sleep _ when he was asked by a reporter for WGAL-TV whether he had forgiven the gunman. "In my heart, yes," he said, explaining it was "through God's help." That's a picture of Wilfred Woodruff, the fourth president of the Mormon church. He's the one that made the proclamation on September 25, 1890, that plural marriage or polygamy would no longer be allowed in the Mormon Church or be a Mormon practice. But the polygamy issue just won't go away. Although, the Mormon church put aside polygamy, under tremendous pressure. many Mormons know that polygamy was the original practice of Mormonism ans that it is the real Mormonism. When Mormons that practice polygamy are called fundamentalist Mormons' it is a correct description. They are the ones that are building their lives on the foundational and fundamental practices of Mormonism. The Mormon church through its young history (it's not even two hundred years old) has had a policy of one prophecy or proclamation from God being over-written by another. A rather convenient doctrine. But polygamy is back and it looks like the battle is going to rage. HBO has a show about a polygamous family called "Big Love." Warren Jeffs, leader of the Fundamentalist Church of Jesus Christ of the Latter Day Saints recently ended up on the FBI's "10 Most Wanted List" along with the likes of Usama bin Laden. I don't think the name Jesus Christ should be the mane of his church, but this is America and you can do that if you want. Look for this battle to come to the forefront as we as a culture of dialog and individualism become increasingly confused about how to think about issues like marriage. When I do pre-marital counseling with couples moving towards marriage I asked them this question, "Who invented marriage anyway?" You be surprised the number of people that have never even asked the question. The answer of course is that God created marriage. If you want to know how marriage works, we'll have to ask him in the pages the scripture. As Francis Schaeffer was fond of saying, "He is there and He is not Silent." On July 17th there was a meeting by the Arab League and they refused to make a strong statement concerning Israel's reaction" to the Hezbollah provocation. This went, as far I can tell, largely unnoticed by the news outlets, but is significant in understanding the conflicts and where the sides are being drawn. The Arabs are not protesting this. Why? The world could not be any crazier at the moment. But for the Bible believing Christian, we've read the end of the book and we know how it finishes. We don't know everything in between, but we have some clues. Sooner or later Iran will invade Israel (Ezekiel 38.) Russia seems to be a likely accomplice from a study of that chapter. When all these things happen is anybody's guess... but it is much closer than it has ever been. So remember what we say, "Keep your feet on the ground, your eyes to the sky and you're heart with people!" Add to that keep your nose in your Bible and your thumb in the newspaper!